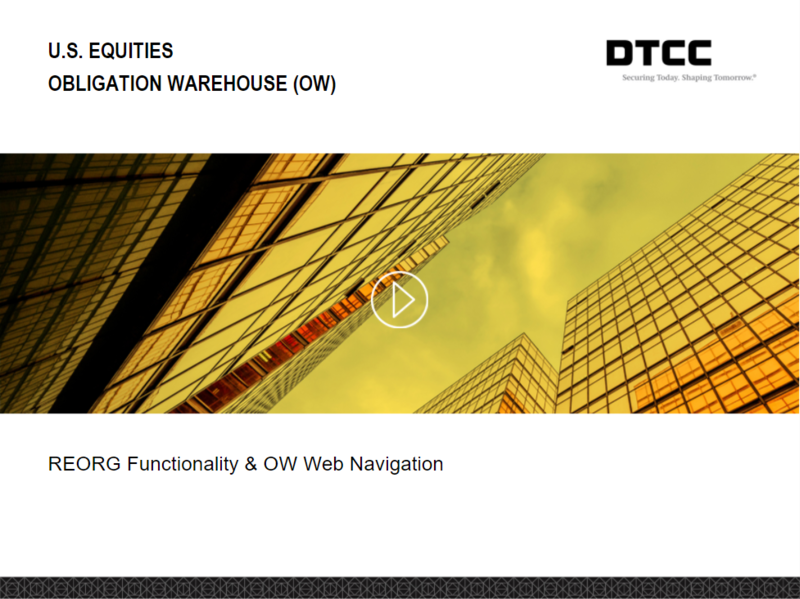 Familiarize yourself with the benefits and features of the Obligation Warehouse and DTCC's Obligation Warehouse (OW) Web application. 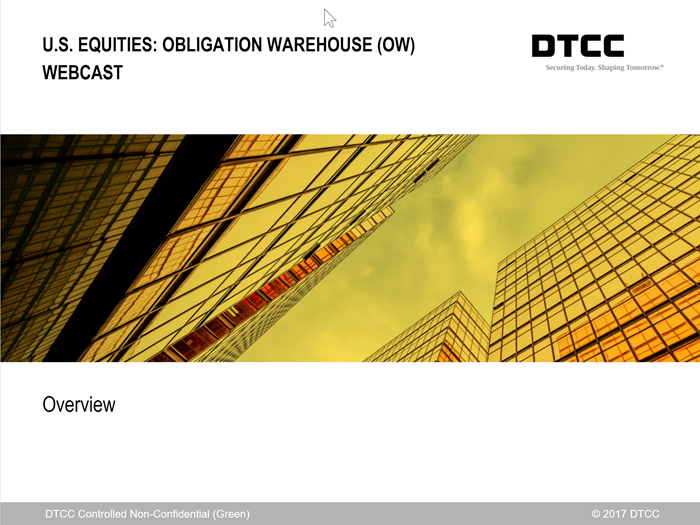 The Obligation Warehouse webcasts provide background information about OW and a high-level overview of the OW Web application. For a comprehensive (200+ page) reference to the OW, view OW Documentation, including the Obligation Warehouse (OW) User Guide. The OW Web Interactive Learning Tool simulates the OW Web application to familiarize you with its interface. 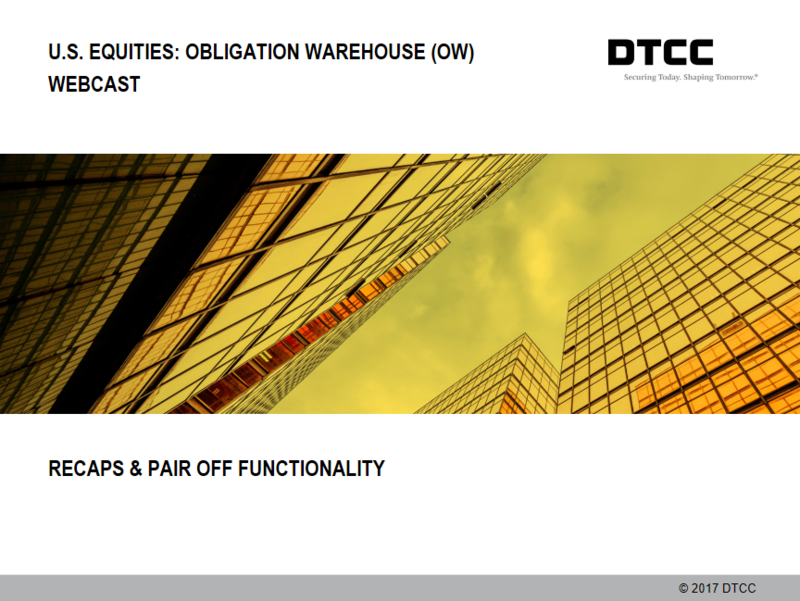 Log in to view Obligation Warehouse content in this Learning Center. Obligation Warehouse (OW) is a product of the National Securities Clearing Corporation (NSCC), which is a Member owned subsidiary of the Depository Trust and Clearing Corporation (DTCC). The services provided for trade capture and clearing create a common repository for the transactions from the marketplaces, including the listed exchanges and alternative trading platforms collectively, and consolidates those transactions to reduce the burden of trade for trade settlement for each transaction. Additionally, NSCC provides a guarantee for specific transactions that are netted through Balance Orders or the Continuous Net Settlement (CNS) accounting service and settled either at NSCC, DTC, or at another depository. The National Securities Clearing Corporation (NSCC) has upgraded and expanded the technology for the Reconfirmation and Pricing Service (RECAPS) and introduced the Obligation Warehouse (OW). The Securities and Exchange Commission (SEC) approved the NSCC Rule filing and Financial Regulatory Authority (FINRA) provided the interpretative guidance to state that the OW is a mandated service for NSCC broker dealer full service members. A central repository of open broker to broker obligations. 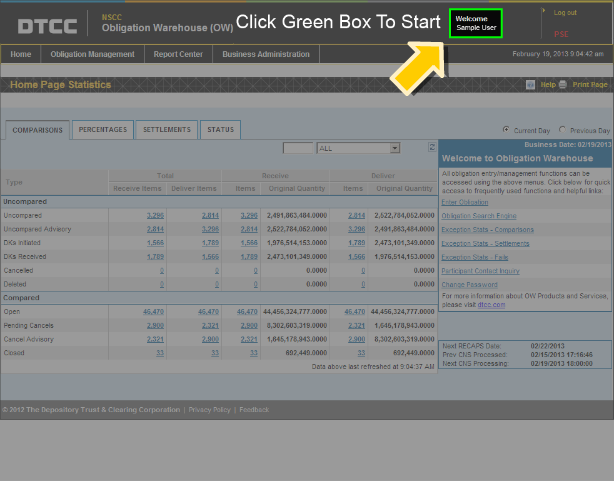 Automate real-time matching / confirmations of ex-clearing, non-CNS obligations. Ability to manage and resolve exceptions, DK’s, in a more timely manner. Servicing of open obligations. Adjusting for corporate actions and scanning for CNS eligibility daily. Risk mitigation and net capital relief through mark to market of open obligations. >Obligation Warehouse provides an automated service for the matching of open obligations in the same securities currently supported by RECAPS. The centralized service supports bilateral matching of fails and other ex-clearing obligations in real time, rather than quarterly, and it communicates a successful match to both parties of the obligation. The database will store non-CNS matched open obligations from trade date through actual settlement date. RECAPS does not store open obligations once they are matched, netted, and re-priced. Obligation Warehouse checks for CNS eligibility, daily, and net, re-price, and re-date non-CNS eligible securities on more frequent basis than the current RECAPS. The OW will also adjust matched fails for mandatory corporate actions. In addition to securities covered under the current RECAPS system, (equities, municipal bonds, corporate bonds, and UIT’s), the Obligation Warehouse will also include receive and deliver instructions issued by the Automated Customer Account Transfer Service (ACATS). Obligation Warehouse (OW) Web is a secure, browser-based obligation entry/ management tool that incorporates robust search capabilities, statistical reporting, and exception processing. The OW Web gives every OW eligible Member access to real-time information, in addition to input and response capability. Additionally, all output files are parsed into sections and defined as reports readily available in the OW Web Report Center for up to two years and thereafter upon request for another five years. Access end of day OW reports both today and historically. The OW Web is simple to use and efficient for obligation entry and reporting. The commands and data are validated in real-time, input errors are reported immediately and invalid data elements are returned directly on the entry screen. Delays associated with batch processing and manual comparison should be significantly reduced. Every obligation submitted, as well as the subsequent related events, are also sent to the Contra to provide both parties with the most updated status. Every obligation is available for viewing on screen regardless of status. Aged obligations are recognizable quickly to assist operational areas in the confirmation and resolution processes.